Rustic fireplaces tend to conjure images of cozy log cabins in the middle of the woods. But before you go too far down the rabbit hole and start imagining yourself watching the snow fall as you listen to the sounds of crackling flames, let's review what "rustic" actually means. By embracing raw materials and natural textures — think wood, concrete, metal, brick, and stonework — this rural style often results in charming and warm spaces that beautifully reflect country living. Easy, right? One of the simplest ways to begin channeling this aesthetic is to allow your fireplace to take center stage. Here are eight unique examples of rustic fireplaces that will instantly transform your abode into an idyllic retreat. Rustic doesn't automatically equal shabby chic. 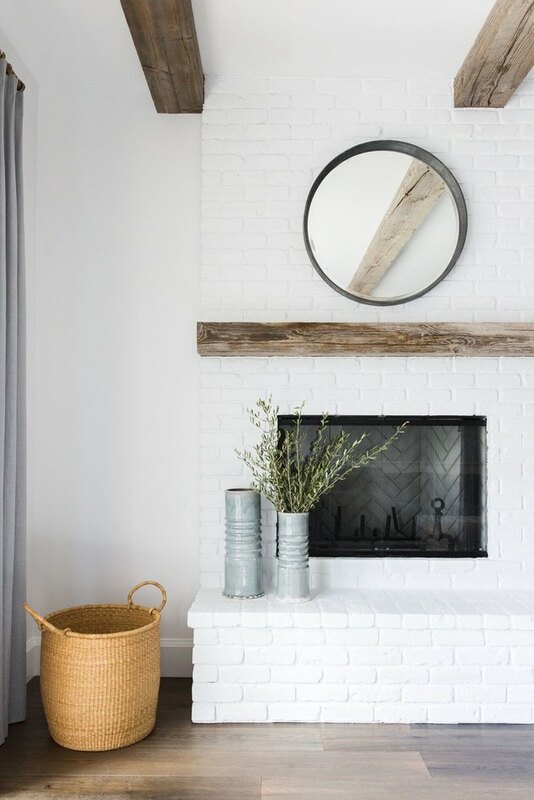 This design from Shea over at Studio McGee shows that by simply painting brickwork and adding a wooden mantel, you can still deliver rustic charm with a modern edge. The addition of a woven basket and ribbed vases help to champion the nature-inspired aesthetic. We love this industrial, timber- and concrete-clad living room. The contemporary black wood-burning stove and chimney is the star of the show, but the eye-catching patterned area rug is a close second. 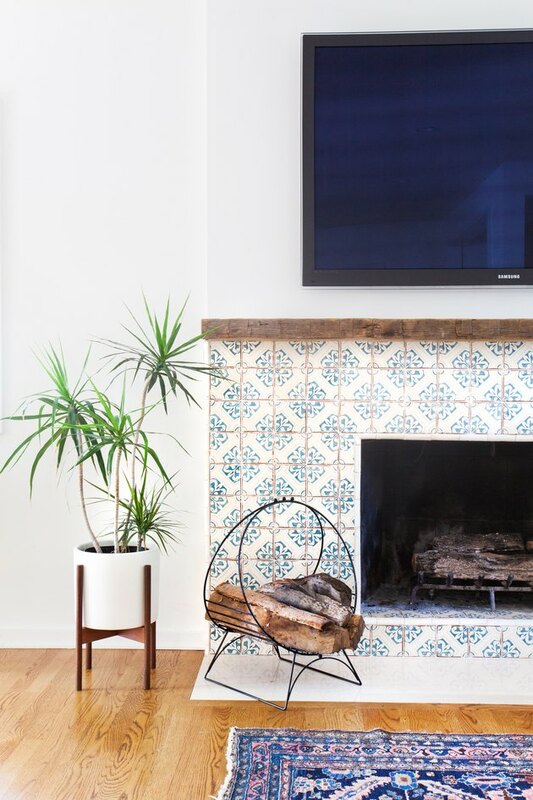 For a more colorful approach to the rustic look, incorporate a fireplace surround covered in vintage patterned tile and a wooden mantel, as shown in this project designed by Amber Lewis. And the steel frame log holder is a great accessory to show the authenticity of this wood-burning fireplace. 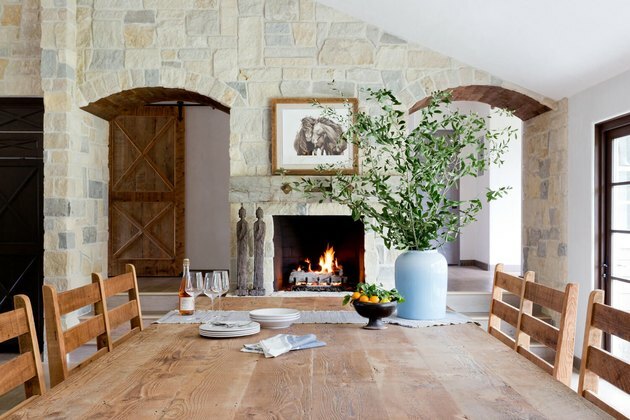 If you're looking for a traditional country cabin retreat, a stone fireplace like the one in this dining room designed by Kate Lester could be the way to go. Stone fireplaces are distinct and full of character, plus natural stone radiates heat longer than other materials so you'll stay warm on those cold winter nights. Fireplaces needn't take up the entirety of a space. 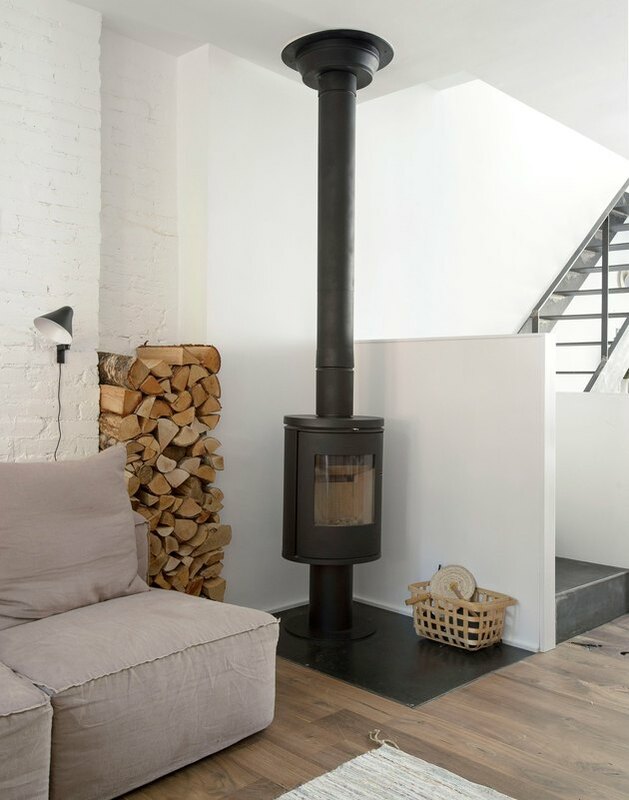 If you're after something a little more compact, or you have an awkward corner, a log burner like this freestanding beauty is a great alternative. Follow the lead of Office of Architecture and incorporate a healthy supply of chopped wood into your design to add visual interest and texture. 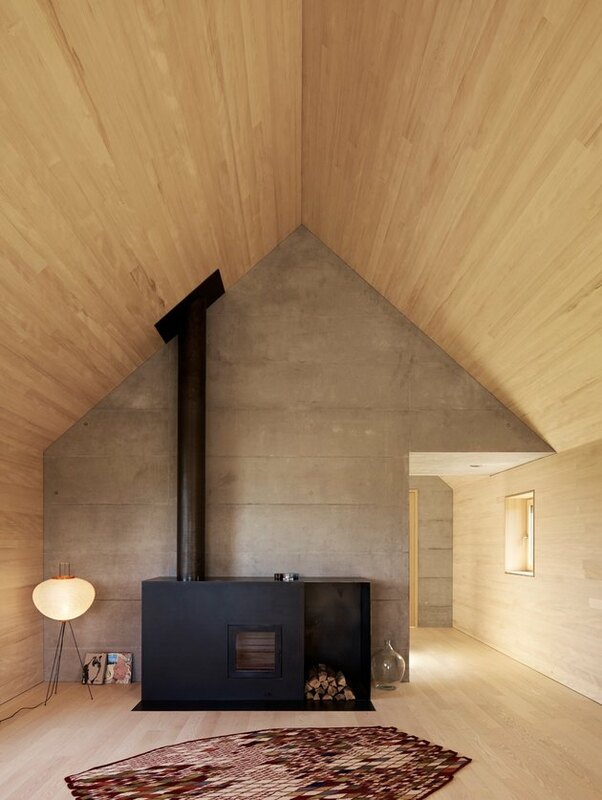 This dark and dreamy setup combines wood cladding, black steel frame windows, and a concrete fireplace complete with matching hood. If you're after a unique look, a concrete design is definitely worth mulling over. This rustic fireplace makeover by Erin from Francois et Moi shows exactly how you can bring the outside in. 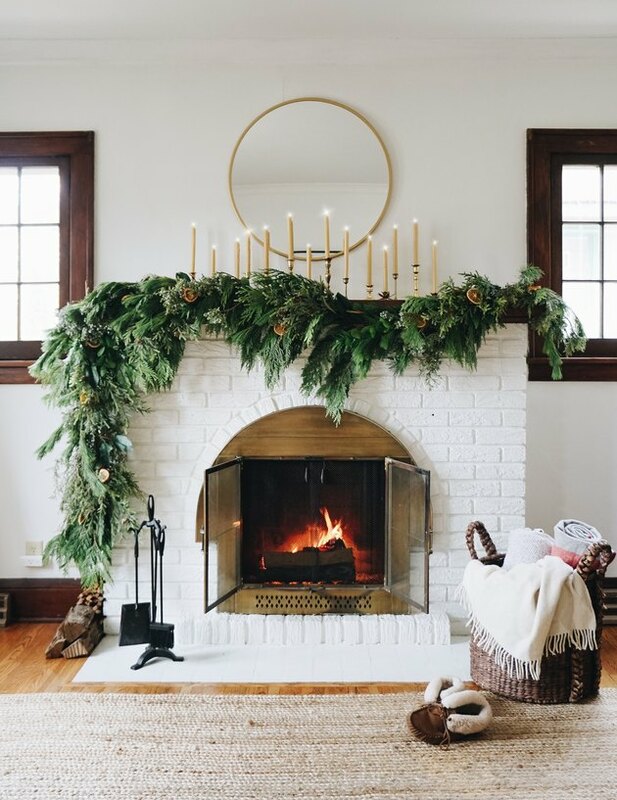 Her simple, white-painted brick fireplace, with wood and brass detailing, has been transformed with the help of a jute rug, woven basket, taper candles, and a verdant DIY garland — perfect inspiration for the festive season. 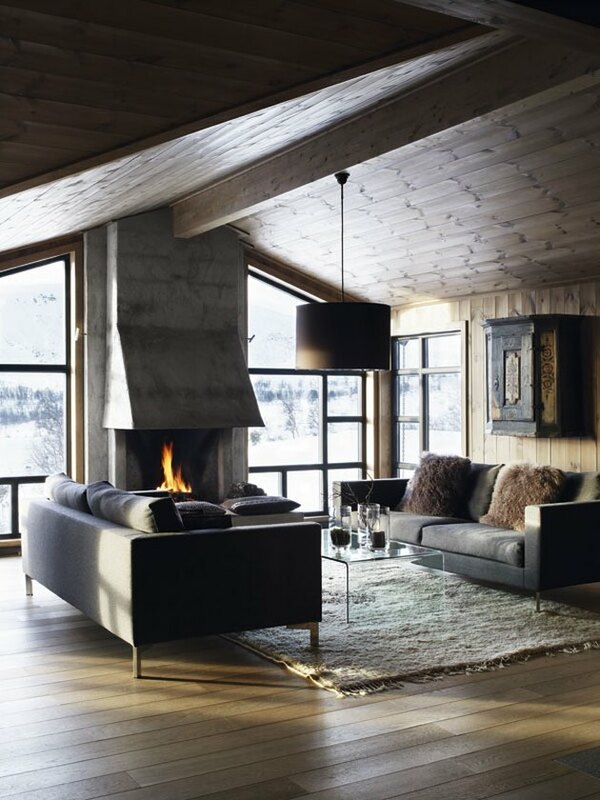 Creating a cozy atmosphere with a rustic fireplace is, needless to say, pretty easy. 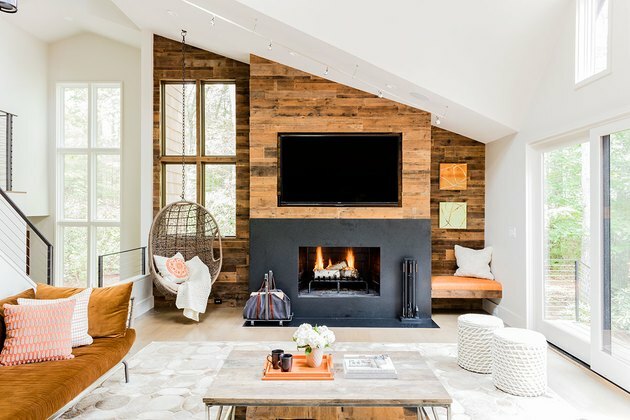 Nevertheless, this living room, designed by Jennifer Palumbo, goes the extra mile with its timber-clad walls and inviting seating options. The black fireplace with steel andirons breaks up the room and adds a bold focal point.